Back in the '90s, Random House released a series of TMNT books and read-along cassette tapes. Three of these sets included a cassette that narrated and performed an included comic book (reprints from the Archie series). 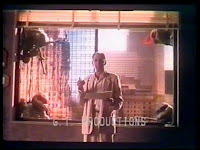 The set pictured at left here included two brand new mini storybooks based on the first movie. 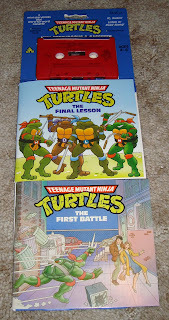 The interesting thing about these books is that while they are most obviously based on the movie, all of the artwork reflects the cartoon Turtles of the time. But the thing I love most here is the included cassette. I remember listening to the cassette using my awesomely hip Sony Walkman while riding in the back seat of my parents' car on a family vacation... and realizing that the same guy who was narrating the story was also doing all of the voices of the different character. Oh, how I LOLed. Now, it's not unusual for one person to read an audiobook and also do all of the voices, but I do think it is a bit more unusual for a children's tape. But really, in this case it just sounds ridiculous and silly. However, I shall leave it to you to judge for yourself. For a limited time, I'm making both audio stories available for download here. I'll also note that each side of the cassette features one of the two stories, read twice. Once without page turn signals and once with page turn signals. I never understood that much, either. Why not put both stories on each side of the cassette and only put the page turn signals on one side? The way it's set up you're stuck either listening to the same story twice in a row or playing the fast-forward game to find the version you want to listen to (ah, the joy of cassette players). German TMNT fan hudemx has reported in again with some new details on the upcoming German DVD release of the first TMNT movie, which will be including special features not yet released anywhere else. Commentary: Director Steve Barron greets the audience in German, but then continues in English for the rest of the duration. 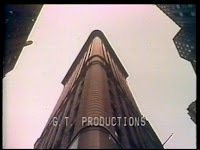 Deleted Scenes: There are two scenes included, both of which are alternate cuts from two scenes in the movie. 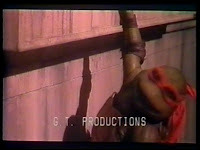 The first is of Michaelangelo ordering pizza in the sewers, and the second is of the Turtles fighting the Foot in April's apartment. Alternate Ending: This is the same ending as has been previously detailed by Ninja Pizza. The DVD is available for pre-order over at Amazon.de, but make sure you're able to play Region 2, PAL-coded DVDs before you do so. Sideshow Collectibles has started sending e-mail notices that their Donatello comiquette, both the exclusive edition and the regular edition, is expected to be in their warehouse in approximately 20 days. These e-mails request that you verify your payment information by February 27, as the cards will be charged soon after as the statues start shipping out to their awaiting homes. If you have an order placed, make sure those credit cards are in order! If you don't have an order placed, it's not too late to get on the wait list. Right now is when cancellations are most likely as people decide whether or not they can actually afford what they pre-ordered several months ago. Original TMNT Movie to be Released in Germany ... With Bonus Features! TMNT fans have been crying out for a better DVD release of the original TMNT movie ever since it first appeared on DVD in 1997. Although it and its sequels have been rereleased several times over the last 13 years, the content on the disc has always been the same, and simple requests like including deleted scenes and director commentary have fallen on deaf ears. For German fans (and region-savvy fans elsewhere) that is now changing!! TMNT fan hudemx at The Technodrome forums has brought to attention the upcoming German DVD release of the 1990 film. If you've been reading this site for awhile, you may recall posts that detailed the alternate ending as well as one of the deleted scenes. So, obviously, this is great news!! Although the bad news is that this seems to be restricted to Germans (for now?). While that may seem like a catch-22 for American fans and other non-Europeans, there are work-arounds to bypass region-locking and PAL coding if you look hard enough. This DVD will be released on March 12, 2010. If you're ready to order, you can go ahead and do so over at Amazon.de.